Are We Facing a Central American Spring? A wave of protests raises the possibility of a “spring” in Central America. The protests started in Guatemala. In April, a surge of protestors denounced severe cases of corruption on the part of the Otto Pérez Molina administration. Since then, every Saturday thousands of people come out to demand the resignation of the government. The protests have extended to Honduras, where people have been marching with torches since mid-May. In June, thousands of people, with a strong showing of youth, took over the streets of Tegucigalpa to demand the resignation of the Honduran President, Juan Orlando Hernandez. The protests have also extended to Nicaragua. The protests against the Daniel Ortega administration are driven by the people’s rejection of the Chinese investment in the interoceanic canal that will destroy the local plants and wildlife. On Sunday, June 14, thousands marched in Juigalpa, the central area of Nicaragua, against the interoceanic project to be carried out by the Chinese company HKND group. Similar to #Passe Livre en Brasil, the Occupy movement in the US, 15M in Spain, and in some ways to the #YoSoy132 and anti-Peña Nieto movements in Mexico in 2012, the movements in Honduras and Guatemala sprang forth spontaneously with a multi-classist make up and a strong showing of youth participation. Even though there hasn’t been an independent participation of the working class, it’s a broad movement. The protesters call themselves los indignados. The process of mobilizations, sparked on social media, is hardly just a “virtual” movement. It’s much deeper, and it has put the Otto Pérez Molina and de Juan Orlando Hernández administrations between a rock and a hard place. 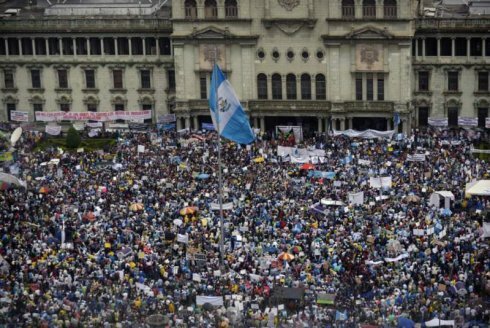 The protest movement in Guatemala has forced the administration into a crisis, obligating them to modify their cabinet. The movement has mobilized around 60 thousand people to protest every Saturday. The Otto Pérez administration and the parties formed after the dictatorship are discussing a call for new elections in September, which the United States imperialist nation is supporting with the hopes that it will quell the great social unrest. In Honduras, tens of thousands of people have turned out for the “torch” marches. The protests, with the slogan #OposicionIndignada, focus on the latest corruption scandal, in which the Honduran Social Security Institute is accused of embezzling 200 million dollars. The traditional political parties in the country are also accused of being involved in the fraud. The US is worried about the wave of protest movements. Naturally the fall of Otto Perez or Juan Orlando Hernandez would motivate people to question the politics that force Guatemala and Honduras into the role of the US imperialists’ backyard. That’s why the Organization of American States (OAS), organization made up of all the Latin American Governments that are subordinated by US imperialism, believes the situation in Guatemala and Honduras to be more critical than movements in Chile, Brazil, and Mexico. As Luis Almagro from the OAS said: “It’s very important for Guatemala to stay within its constitutional bounds until the September elections and that nothing interrupts their democratic process. Its a severe crisis, we’ve seen protests for weeks." Including Rigoberta Menchú, who was sadly viewed as a celebrity in Mexico for calling for the backing of the latest mid-term elections and who called out the family of the missing 43 students for boycotting the elections, believes that due to the withdrawal of the president’s judicial immunity, the resignation of president Otto Perez Molina is practically inevitable. For the US it’s vital that the elections in Honduras take place. In the case of Guatemala, it’s very important for the movement to take the offensive and to organize a general strike calling for the main unions to knock down the weak Otto Perez government. The fact that the OAS insists on calling for elections is a sign of the corrupt government’s instability. The possibility of a “Spring” that takes down the National Party regime is dependent upon the participation of the working class. It’s important to look to the examples of the Gafsta miners in Tunis or the textile workers in Egypt. As we have suggested in other articles, the independent mobilization of the working class is essential. With the call for a general strike the unions could hold a genuine Free and Sovereign Constituent Assembly where the most pressing problems of the nation could be discussed. In Honduras the movement proposed the intervention of the UN in order to install the International Commission Against Impunity. This is a serious mistake. The UN is responsible for the pillaging of Latin America with the backing of the imperialists. This is a grave political error when it’s been demonstrated that the UN peace missions are running human trafficking and prostitution rings. Impunity organized by the UN imperialist thieves? In Honduras, it’s imperative that the movement takes up an anti-imperialist and independent perspective. The “torch” protests have even more potential when they condemn the imperialist intervention that became ever more prominent after the 2009 coup against Manuel Zelaya. It’s imperative that the workers put forth a plan that is independent of the political parties of the regime. As we have suggested in other articles, the idea is to create greater horizons that go beyond the fight against corruption, in which the opposing political parties are also involved. The fall of Juan Orlando Hernández’s corrupt political regime is possible if the workers organize democratically from below and take leadership of the “torch” marches; if they put forth, through mobilizations and a general strike, a Free and Sovereign Constituent Assembly where the demands of the people and how to resolve them can be discussed freely, rejecting any conditions or restrictions proposed by the dominating class.